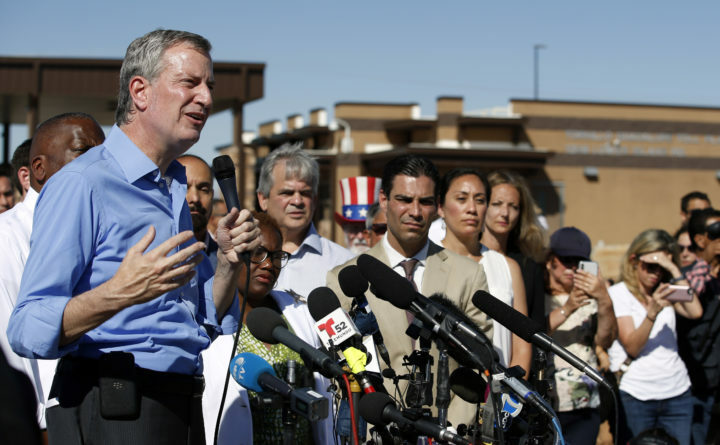 New York Mayor Bill de Blasio speaks alongside a group of other U.S. mayors during a news conference outside a holding facility for immigrant children in Tornillo, Texas, near the Mexico border, June 21, 2018. U.S. Customs and Border Protection is alleging that de Blasio illegally crossed from Mexico into the U.S. while visiting the El Paso, Texas, area in June, an accusation the mayor’s office flatly denies. More than 2,300 families were separated as a result of the administration’s zero-tolerance policy, which referred anyone caught crossing illegally for criminal prosecution. The mayors said Trump had failed to address a humanitarian crisis of his own making.